October 1, 2014 – TICKETS STILL AVAILABLE! 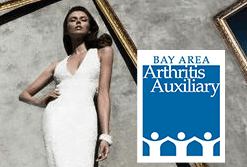 Past Bay Area Arthritis Auxiliary (BAAA) fashion shows have featured designers such as Colleen Quen Couture, Karen Caldwell Design, The Wilkes Bashford Collection and Lili Samii. Every year, our Fashion Show and Luncheon hosts nearly 400 of San Francisco’s leaders, celebrities and philanthropists. Annually, over $250K is raised as a result of this spectacular event. An event of the magnitude of the Bay Area Arthritis Auxiliary Fashion Show takes a village, and it starts with the tireless efforts of Fashion Show Chair Sharon Seto, Honorary Co-Chair Iris Chan, Luncheon Chair Betsy Vobach and the 2013 Fashion Show Chair, Sharon Seto. 2014 is bound to be even more exciting! As President of the Bay Area Arthritis Auxiliary I am excited to announce that with ticket sales soon to close on Friday, September 19th, we are nearly sold out. What’s the commotion? Well, the 2014 Benefit, Fashion Show and Luncheon on Wednesday, Oct 1, 2014 from 10:30am–1:30pm, will include a very special guest… Renowned designer Carmen Marc Valvo. In this photo: Designer Carmen Marc Valvo is pictured to the left with Pamela Culp at the BAAA Benefit & Fashion Show Launch Party at SAKS in San Francisco earlier this year. While tickets are still available, we would love for you to join us to witness the splendor of Carmen Marc Valvo on our runway – Celebrate via fun and fashion as we unite to prevent, control and cure arthritis. Carmen Marc Valvo’s began to get noticed when he designed ready to wear for Nina Ricci and Christian Dior. Soon, however, it was time to move on, and with only a few thousand dollars and fearless determination, he brought his first solo collection to light and launched his own label 1989 – Just in time for the New York Fall Market! Recognized early for his designs in sportswear, it was ultimately his evening wear that struck the deepest cord with buyers of note at the top retailers in New York City. And so it began. Carmen Marc Valvo Couture launched in 1998 to satisfy the ever-increasing desire from celebs for his red carpet creations. Valvo’s gowns are extraordinary. The quintessential and sought-after designer of his time, his designs are alive with meticulous hand-detailing. As a result, his Couture Collection is set apart and above, thereby securing him a seat at the Who’s Who of American fashion. Available through close of registration on Friday, September 19, 2014, or until they are sold out. 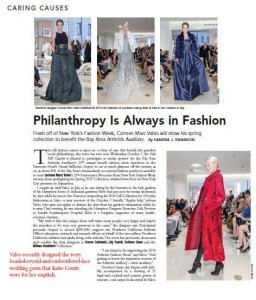 Our media sponsor the Nob Hill Gazette ran a great piece in the September issue about Carmen Marc Valvo and the upcoming Benefit & Fashion Show. Check it out on newsstands now! Founded in 2004, by philanthropist Patricia Sprincin, the Bay Area Arthritis Auxiliary (BAAA) and its tireless volunteers are here to make life better for Bay Area residents living with arthritis. In northern California alone, there are over 2 million children and adults who live, daily, with the challenge and pain that can come with arthritis. The dedicated members of the Bay Area Arthritis Auxiliary share a passion for making a difference. With a focus on the prevention, control and cure of arthritis and other autoimmune diseases, they raise funds and awareness through fundraising events, education and outreach.